The preamplifier is intended for use with dynamic (moving coil–MC) microphones with an impedance up to 200 Ω and balanced terminals. It is a fairly simple design, which may also be considered as a single stage instrument amplifier based on a Type NE5534 op amp. To achieve maximum common-mode rejection (CMR) with a balanced signal, the division ratios of the dividers (R1-R4 and R2-R5 respectively) at the inputs of the op amp must be identical. Since this may be difficult to achieve in practice, a preset potentiometer, P1, is connected in series with R5. The preset enables the common-mode rejection to be set optimally. Capacitor C1 prevents any direct voltage at the input, while resistor R7 ensures stability of the amplifier with capacitive loads. 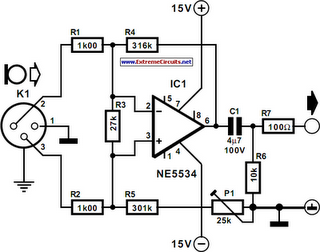 Resistor R3 prevents the amplifier going into oscillation when the input is open circuit. If the microphone cable is of reasonable length, R3 is not necessary, since the parasitic capacitance of the cable ensures stability of the amplifier. It should be noted, however, that R3 improves the CMR from >70 dB to >80 dB. Performance of the preamplifier is very good. The THD+N (total harmonic distortion plus noise) is smaller than 0.1% with an input signal of 1 mV and a source impedance of 50 Ω. Under the same conditions, the signal-to-noise ratio is –62.5 dBA. With component values as specified, the gain of the amplifier is 50 dB (´316). After careful adjustment of P1 at 1 kHz, the CMR, without R3, is 120 dB. 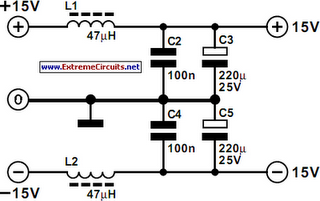 The supply voltage is ±15 V. The amplifier draws a current at that voltage of about 5.5 mA. Note the decoupling of the supply lines with L1, L2, C2–C5.